A group calling for a change in the way fathers are treated in family courts have held a rally in central London. Fathers 4 Justice organised the demonstration on Wednesday as part of its campaign of civil disobedience across the UK. It wants divorced fathers to be given proper access to their children. 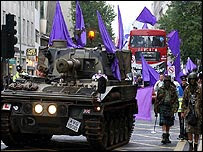 Michael Cox, the group's legal adviser, claimed 2,000 people took part in the protest marching to Temple Place via the Royal Courts of Justice and Lincoln's Inn Fields. The rally follows a costumed roof-top protest at the Royal Courts of Justice which began on Tuesday. Campaigners Jolly Stanesby, from Ivybridge, Devon, and Eddie Goreckwi, from Romford, Essex, who are dressed up as Batman and Robin, are into the second day of their week-long protest. Mr Cox said: "We were marching today to draw attention to the fact the family courts are failing to act in the best interests of our children. "We want a legal presumption of contact. As parents men don't have a right to see their children following a divorce or separation. "All they have is a right to apply to court to see their children but the courts are institutionally biased against the father. "Fathers are reduced to pleading with the mother to see their children." Previous action by campaigners includes painting the doors of court welfare offices purple - the international colour of equality. 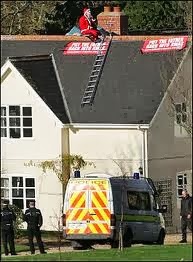 Police said they are continuing to monitor the two men on the roof of the Royal Courts. Campaigners Jolly Stanesby, from Ivybridge, Devon, and Eddie Goreckwi, from Romford, Essex, climbed onto the roof of the building on The Strand just after 0400 BST on Tuesday. Group spokesman Glen Poole said the men were a new group called “the caped crusaders for justice”. He said they were hoping to draw attention to the group’s campaign to ensure divorced fathers were given proper access to their children. The protesters had scaled the side of the court building in The Strand at just after 4am. 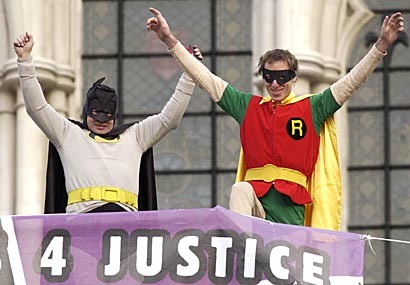 A Scotland Yard spokesman confirmed that two men dressed as Batman and Robin were on the roof of the courts. “We are monitoring the situation and trying to persuade them to come down,” he said.